Reliable, Friendly, Experienced…Being your dog’s best friend when you aren’t able to. 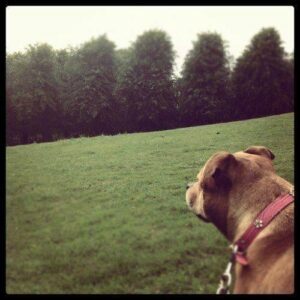 Dolly’s Dogs formed in late 2012, and is run solely by Hannah Galpin. Hannah has a history of working in various fields, from customer service to banking, and has a degree in Media, but is now running Dolly’s Dogs full-time, with a view to gaining qualifications in dog training and canine psychology. Hannah has years of personal experience and has long been trusted with dog walking and dog-sitting, with Mia the Boxer, Rosie the Cockapoo and Herbie the Labrador just a few of her past happy canine customers! Hannah grew up surrounded by different dogs, with two jack russell’s, a black labrador, and a fluffy cockapoo now in her immediate family. Starting Dolly’s Dogs is fulfilling a dream Hannah never realized was hers, having always had a natural affinity and confident ability with dogs. Dolly’s dogs prices are truly competitive and if you are looking for a new dog-walker, just moved to the area or introduced a puppy into your home, than look no further! The service primarily offered is dog-walking however pet-sitting, puppy visits and cat visits are also on offer. Solo walking and group walks are offered as well as puppy socialisation. Dolly’s Dogs have looked after our puppy from a very young age and has provided a brilliant service. Hannah is very knowledgable and has assisted in the training of our puppy. Hannah does puppy visits and walks for us and I can go to work at ease, knowing that Hannah will be visiting our puppy to care for her while we are out. She is very trustworthy and I would highly recommend Dolly’s Dogs. I would highly recommend Dollys dogs to anyone and their dogs/pets. Very trust worthy and reliable. Our dog is always so happy to see Hannah which is so important. I have known hannah for 12 years and her knowledge and love of dogs are among some of her best attributes. She has looked after our house cat (who is very shy and nervous around strangers) on numerous occasions and I would trust her to look after him in the future above anyone else. Her gentle nature and confidence around animals is what makes her business unique. I am certain she has found her calling. This entry was posted in Hampshire and tagged Bitterne, Botley, Bursledon, Eastleigh, Hedge-End, Midanbury, west end, Whiteley. Bookmark the permalink.